Taking the step forward to get you and your smile healthy. At Thompson Family Dental at Nora, we firmly believe in comprehensive dentistry, which focuses on the overall picture of your oral and overall health. With your partnership between you and Dr. Thompson, we’ll take a look how your smile affects the rest of your body. Are you having trouble chewing or speaking clearly? From there, we’ll strategize a comprehensive plan that reaches your smile goals in the long term. Dr. Thompson has close relationships with many specialists throughout the area to ensure your plan goes smoothly. Your treatment plan is a two-way relationship with us. With your help, we can get your smile’s health and beauty the way you want it to be. We invite you to schedule a consultation with our office to see if we’re the right fit for you. Wonderful! Dr. Thompson is incredible and I refer people to her whenever I possibly can! Missing teeth? Having bite issues? Is it difficult to speak clearly or eat your favorite foods? Our restorative dental services can help. Our comprehensive exams are very important to properly diagnose and determine the root cause of your dental problems. 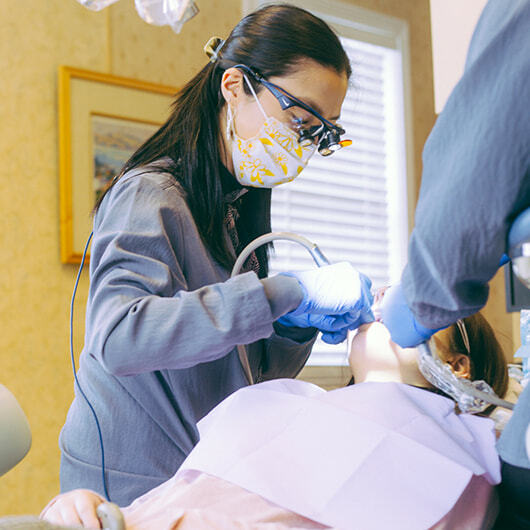 Not only is this diagnosis important to relieve you of pain, but it will help you save time and money in your dental care. Dental Implants: An excellent restoration option to replace missing teeth or to deal with rebellious sliding dentures. Dr. Thompson will closely work with your oral surgeon to ensure the best, most predictable outcome. Dentures: Another excellent alternative to replace missing teeth. We offer a multitude of options, including conventional dentures and implant-supported dentures. Full Mouth Rehabilitation: A combination of dental services that first focuses on restoring your bite and function, then on the aesthetics. No matter your reason for visiting the dentist, you can come as you are – we don’t judge! Together, we can achieve your smile goals and get you smiling again. Are you scared of the dentist? Did you have a bad experience in the past? Dr. Thompson can help you put those fears to rest with our sedation options. Aligning your smile to its ideal position is crucial for optimal oral health. Luckily, we offer Invisalign and ClearCorrect. Along with the aesthetic benefits these methods offer, they’re non-invasive and conservative with natural tooth structures, keeping your smile healthy. You have minor tooth misalignment issues, such as crowded teeth, gaps between teeth, overbite, underbite, etc. Not everyone is a candidate for Invisalign or ClearCorrect. Please contact us today to schedule your cosmetic consultation with Dr. Thompson today. Are you picturing your perfect smile? Cosmetic dentistry is the perfect solution to achieving your dream smile. Too good to be true? Schedule your cosmetic consultation with Dr. Thompson today! Your journey towards a healthy, beautiful smile is only a few clicks away.